Dorado, Puerto Rico – Leading golf course operator KemperSports, in connection with Robert Trent Jones II Golf Course Architects and Dorado Beach Resort, announced Jan. 4 that the famed East course at Dorado Beach Resort and Club commenced a major modern restoration project. The original Dorado Beach 18-hole golf course was carved through tidal wetlands with wonderful views of the Atlantic Ocean. It was designed by Robert Trent Jones, Sr. in 1958, and was enlarged to the current 36-hole routing in 1966. The East and West courses consistently rank among the best in the Caribbean. KemperSports, the Northbrook, Ill.-based company that has managed Dorado Beach Resort and Club since 2006, will oversee construction for the one-year restoration project, which began in September 2010. The project philosophy being implemented by RTJ II is recapturing the original design philosophy while uncovering a more flexible and fun course for all players. The restoration will include the following work: tee adjustments for length and angle; significant pruning and removal of vegetation to highlight views of the Atlantic Ocean and to uncover course features; the re-establishment of the Robert Trent Jones, Sr. design philosophy by recapturing the original green sizes and configurations, as well as restoring the bunkers to their original style and shot value; some bunker repositioning to accommodate technological advances in modern equipment; new areas of fairway to make the course more flexible for a wider range of players by allowing bump and run shots; and the revision of surface drainage patterns to allow the course to be played quickly after rainfall. Lake edges will be cleaned and reshaped to more clearly define the water hazards to the player and enhance the aesthetics. The lakes will also be enlarged to allow for more surface water storage. Selective tree pruning will allow more sunlight on turf-grass for healthy growth and better playing conditions. “It’s a treat for me at this point in my career to have the opportunity to refresh some of my father’s most notable work,” said Robert Trent Jones Jr. “I came to Dorado as a teenager when my father was working here and started to realize how exciting golf course architecture is. It was a formative moment at the very beginning of my career. Robert Trent Jones, Jr., has designed more than 270 golf courses in more than 40 countries over the last 40 years. His award-winning designs include The Prince at Princeville in Kauai, Hawaii, Links at Spanish Bay in Pebble Beach, Calif., and KemperSports-managed Chambers Bay in University Park, Wash., site of the 2010 U.S. Amateur and 2015 U.S. Open Championships. The Dorado Beach East Course has hosted numerous prestigious events since its opening, including the 1963 Canada Cup, the 1964 Shell’s Wonderful World of Golf event, the Senior PGA Tour Championship from 1990 through 1993, the Champions Tour’s Tournament of Champions in 1995 and 1996, the PGA TOUR’s World Cup of Golf in 1994 and the Chrysler Senior Match Play Challenge in 1999 and 2000. 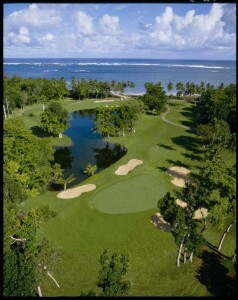 By adding length to the course, Dorado Beach East can once again host world-class golf events. The resort was once a popular destination for celebrities of the 1960s, including hall of fame baseball players Mickey Mantle and Joe DiMaggio, and former U.S. Presidents Gerald Ford, Dwight Eisenhower and John F. Kennedy. Northbrook, Ill.-based KemperSports operates golf facilities as well as athletic clubs, lodging venues and major sporting events, including nationally ranked courses and tournament venues such as Bandon Dunes Golf Resort, The Glen Club, Desert Willow Golf Resort and Chambers Bay.